This weekend sees the start of the 2013 Rugby Championship tournament. With Australia boasting a new coach still smarting from their Lions series defeat, New Zealand for some reason still leaning heavily on older, out-of-form players, South Africa frantically calling in reinforcements from Japan and elsewhere, and Argentina recovering from a summer pasting by England, it looks to be a very open and intriguing tournament. But let’s face it, the rugby is of secondary importance here – what really matters, as we all know, is who’s wearing the best shirt. Obviously. So, let’s take a look at what the Southern Hemisphere titans will be covering their modesty with this time out. The clear favourites and current champions of everything in the international rugby stakes will shock the world by wearing a black shirt with white bits on it this year. We know, we can barely contain our excitement either. You have to feel for Adidas’ kit designers, as there’s really very little you can do with an All Black jersey – they might as well give it to the work experience lad, yknow? That said, there are some subtle differences from the 2011/12 shirt that we’ve noticed – the slighty odd ‘half-white’ collar they wore last time out now goes all the way around the neckline, and looks much better for it, and in this image at least, the famous silver fern actually looks a bit more silver than it has done before – it’s traditionally been white, but we like it. Quite why they’ve made the fern and the Adidas logo silver and left the AIG logo white is a matter for the suits to discuss, but there’s no doubt it looks weird. And while we’re at it – New Zealand, you’ve got a shirt sponsort now, deal with it. 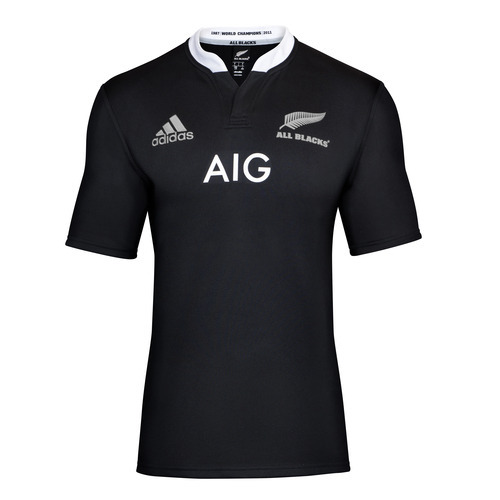 By making the AIG logo tiny and too far up the chest, you’re not ‘preserving the sanctity of the All Black jersey’ – you’re just making it look like the shirt sponsor has been hurriedly pressed onto the jersey by the lad down the local sports supply shop. You’re probably all familiar with this shirt already after the Lions tour, but let’s take a moment to appreciate what is a very fine bit of rugby shirt design. 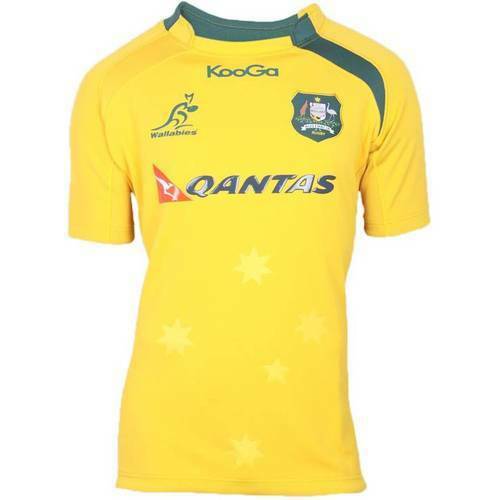 We’re not the biggest fans of Kooga here at Rugby Shirt Watch, their shirts tend to have all the class and restraint of a 90s shell suit, but you have to hand it to them for what they’ve done with the Wallaby shirt. Last year‘s effort was handsome and understated, if a little dull, but this one keeps things class, but adds a bit of modern design flair with that green collar/shoulder stripe motif – and it works. If this is what happens when the designers at Kooga spend a bit of time thinking about making a great rugby shirt, we really wish they’d do it more. It’s more of the same from Canterbury and South Africa, although let’s face it, there’s not a lot wrong with what the New Zealand firm have done with the Springbok shirt in recent years. 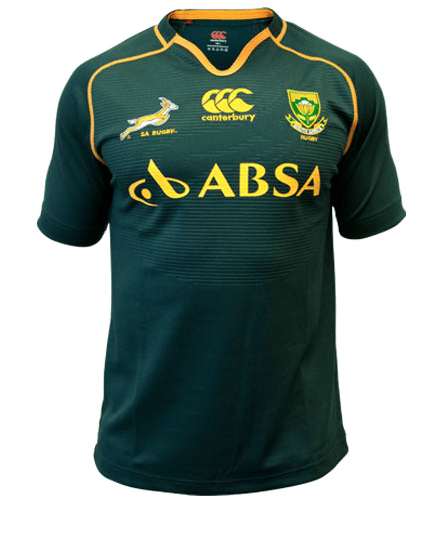 We like the toning down of the colour palette – all you need on a South Africa shirt if green and gold, and the use of subtle contrast piping and ribbing on the body of the shirt stops it from looking too plain – the new collar design is pretty decent too. As an aside, while it might not make an appearance at all, we really hope that the Springboks’ new alternate kit gets a run-out away to the All Blacks – lime green and white, how smart is that?! 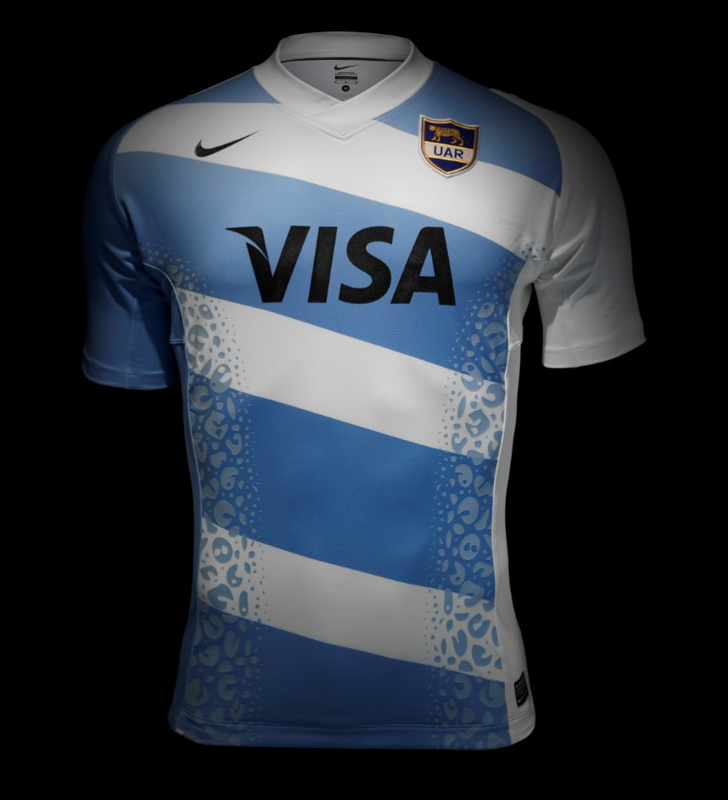 The team that turned the Tri-Nations into the Rugby Championship celebrated their entrance to the top table of international rugby with a new kit supplier in Nike, and an abandonment of the traditional horizontal blue and white hoops,for a more angled affair. As you can see, there’s not much to choose between this year and last year’s efforts, with one unfortunate addition – yup, those really are ‘puma spots’ up the sides of the shirt. We’re sure Nike would tell us that they’re designed to enhance grip on the ball, or some such nonsense, but honestly, they just look like the shirt has some kind of awful skin condition… Argentina unveiled a rather different post-Championship kit last year, that was bold and daring, but in a much more enjoyable way – Nike should have carried on down that road and left the animal-based gimmicks to less reputable suppliers.